Cruising since Braunston Summit has had a sense of finality about it. was to be the last proper tunnel of the year. The tunnel light checked, the cabin lights turned on, the flood light was mounted on the engine hatch – and yes, the bow was struck by an oncoming Napton hire boat… It’s a tunnel wide enough for a broad beam boat but narrowboats can use it cruising in opposite directions. Braunston has long been regarded as the historic hub of the Midlands canals. Here the Grand Union from the south heads west and then north to Leamington Spa, Warwick and Birmingham. From Napton Junction 5 miles to the west comes the Oxford Canal linking Oxford and the route to Coventry via Braunston. The many canal side buildings exude charm and history (a date detected in the pumping station chimney). and this gable end of a village house. Monday morning saw the boats descend the last two Braunston locks (the end of a fine summer of canal and river cruising, of lock sharing and of 68 nights spent moored near each other). Less noteworthy perhaps was the end of the pink fishing net, much cherished over the years by the Cheshire One, it being broken beyond repair and consigned to a Braunston rubbish skip. 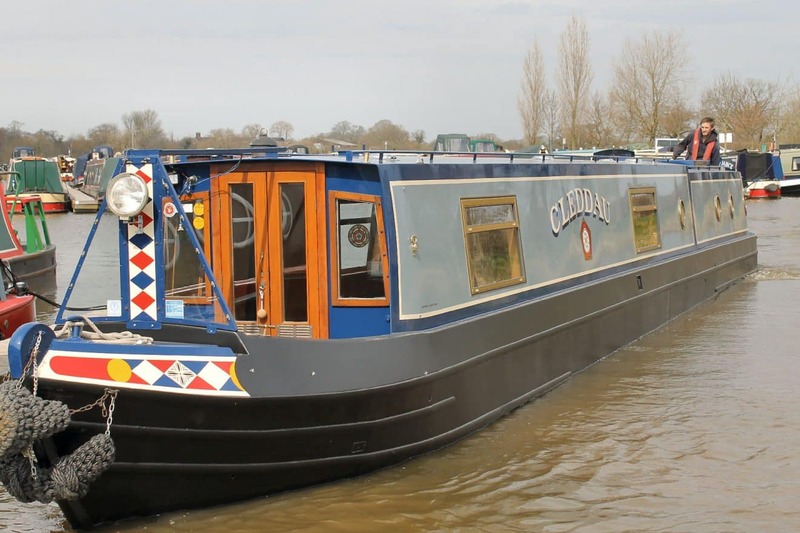 and Cleddau keeping right along the North Oxford Canal, heading for new winter quarters in Staffordshire. and the very noticeable ridge and furrow formations in the fields. and, a bit further on, the M45 (opened in 1959). 7 miles from Braunston are the Hillmorton Locks. They are paired narrow locks, apparently the busiest on the canal network. Since high summer water restrictions have been in place. When Cleddau arrived at about 1.30 pm there were four boats ahead waiting to go through the top lock and three queuing to go down the middle lock. Only one of each pair of locks was usable, the other being padlocked shut.
. Nothing was happening, nothing was moving… A sixth boat drew in at the back of the queue and soon the Captain was deep in conversation, indicating the Pembrokeshire county flag and the flag of St David. “Our daughter is a verger at St David’s Cathedral,” said the Nottingham-based boater. Should this count as a late season Monkton Moment*…? A lock keeper appeared, wanting a boat count and letting more water down the flight via the padlocked offside top chamber. Slowly boats began to move, congestion building up again at the one operating middle lock where one ground paddle was out of action. 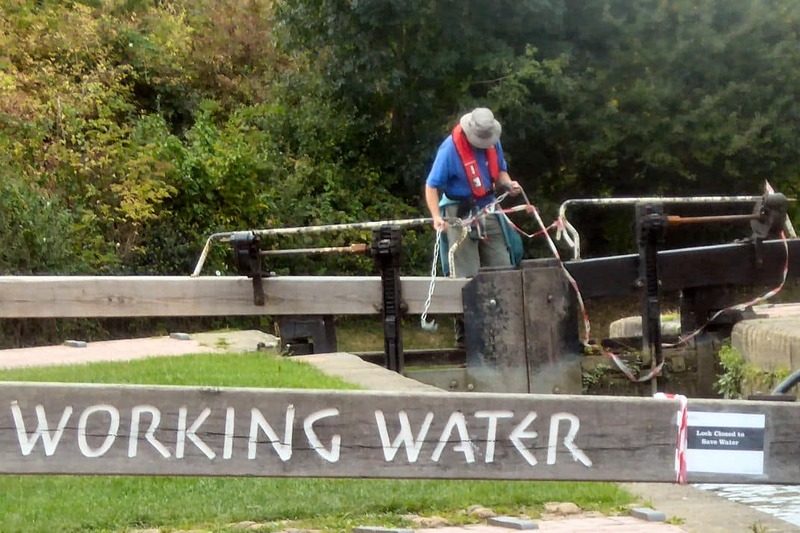 Then, an act of generosity: the lock keeper unlocked the other middle lock to allow more traffic. “Don’t want boats still in here at 5 o’clock,” was his reasoning. As if a new checkout lane had been opened at the supermarket the Captain slid the trolley boat across to the towpath side, proceeded down through the lock and on straight into a full bottom lock. A watch check revealed a two hour transit from arrival at the top to exit from the bottom. Onwards, to moor overnight near Rugby Golf Course. Halfie in a recent blog had mentioned the building works at Hillmorton and thereabouts. Wow – the earth movers have been busy. This piece of stunning landscape was made famous in 1927 when its familiar radio masts transmitted the country’s first ever phone conversation across the globe. This call was made to America, and was received in a town in Maine, called Houlton. and after crossing with dozens of other travelling boats. it was an easier cruise for the last few miles to Marston Junction as the wind was largely behind the boat. a leaf blown into the mid-morning coffee mug and leaves in strange places inside the boat – it’s the end of summer, seemingly!